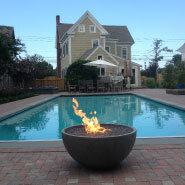 A new fire pit will not only add ambiance but extend your season! Enjoy getting outside earlier in the spring and stay out later in the fall! Pemberton Appliance is here to help make your patio dreams come true. Our team are gas appliance experts, specializing in the design, installation and service of fire pits. Give us a call today! From design to installation Pemberton can make your fire pit dreams a reality. We also specialize in custom gas lighting for outdoor spaces. Seeing your project through from design to the first party around the fire pit is why we produce great results every time. Enjoy getting outside earlier in the spring and stay out later in the fall!